Images: details from a painting by Kanwar Singh (ArtofPunjab.com). A scene of celestial beauty! Seven of the tallest snow-clad Himalayan peaks surround a spot where an ascetic sits in deep meditation. All around is an aura of peace and serenity. The ascetic opened his eyes and looked around. He was disturbed. After a long, long time of meditation and tapasya, he had felt that he was in the presence of the Almighty, and now these words telling him to go into the world and create the Ideal Man! Guru Gobind Singh sat in a deeply contemplative mood at Anandpur. The people of the country were suffering under the Mughal invaders who had looted and plundered the nation’s wealth and had stayed on to rule the populace with an iron hand. To the other woes of the people had been added the terrible hardship of religious bigotry and intolerance. No one was free to worship in his own way, but was instead under constant threat to either accept the religion of the rulers or die. People had lost their physical and moral strength and were unable to put up a unified resistance against this tyranny. Something needed to be done to ignite the spark of honour and self-worth in their hearts. 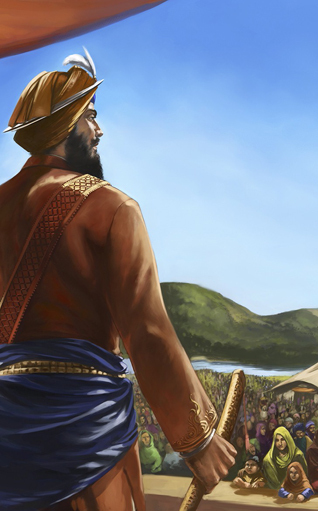 “I have given you the title of my Son with the purpose of establishing the Khalsa Panth. Go into the world and create a kingdom of righteous living by teaching the people to give up their wrongful thinking. “Yes, the Almighty had blessed me with these words before I left Sachkhand. But I still do not know how to carry out His wishes. O Father, my beloved Father, help me so that I can carry out your bidding wisely,” he prayed. He had a luminous face with classic, handsome features, strong physique, a beautiful soft beard, lustrous hair covered with an impressive turban, shining forehead, red cheeks, eyes glowing with a deep love, a heart full of courage but no aggression, buoyancy of spirit but no anger. Here stood a figure of immense authority with a sword in one hand held up more as a shield, a pen in the other hand to spell out fairness and justice. He wore a short robe and loose shorts, a ‘kummerkassa’ (cummerbund), tied tightly around his waist. His arms were long and biceps well-muscled, the legs were well-toned and looked like they could move with agility. The overall look conveyed physical strength. There was an aura of a heart filled with naam, a gentleness and beauty, with a mind ruled by logic and self-reliance. Guru Sahib’s efforts had produced a priceless gem. In joyous and buoyant spirits, He returned to Anandpur. Guru Sahib believed that a strong character was essential for a community, a nation, to progress. It was the very foundation of spiritual faith. He wanted to combine the qualities of character, faith and courage in his Ideal Man. He had tested various categories of people and found them wanting. Now, he decided to put his Sikhs to the test. He knew that the teachings and example of the Nine Masters preceding him had firmly embedded in his Sikhs the love of naam, gurbani, and complete faith in Waheguru. Sikhi was based on Truth and Truthful Living, love for one another with the ability to sacrifice oneself for others, whenever the need arose. But Guru Sahib wanted something more. The Sixth Master, Guru Hargobind Sahib had inculcated in his army how to be prepared to die for righteousness. Guru Gobind Singh wanted that lesson to become part of the mindset of each and every Sikh. Bur first he needed to test the Sikhs to see if they were ready for this. Missives were sent everywhere asking all Sikhs to come to Anandpur for the Vaisakhi festival. When the day came, the huge pandal or enclosure was completely filled. After the kirtan was over, the vast congregation waited in silence for Guru Sahib to speak. There was a stunned silence. No one moved and then, a wave of commotion started. The Sikhs looked at each other, felt a surge of emotion to obey Guru Sahib’s call, then subsided in confusion. None dared to look at Guru Sahib, his aura was so powerful that human eyes could not absorb the sight. No one in that vast crowd seemed capable of movement. To say ‘no’ was to go against the principles of Sikhi, while love of life was so strong that it was most difficult to say ‘yes’. ‘Dil Zor’ Guru Sahib caught him by the hand and took him into a tent erected nearby. Some rushed to Mata Gujri (Guru Sahib’s mother) to seek her intervention. He too, was taken into the tent. He too was taken into the tent. And once again, a Sikh, Sahib Ram, a barber from Bidar came up with a smile on his face and the humble request to take his head too! He was taken away by Guru Sahib. The Sikhs were terrified, yet some semblance of faith and love for him held them rooted to the spot. They watched in awe as yet again Guru Sahib came out and called for one more head. This time too, a man got up and humbly offered his head. His name was Himmat from Jagannath; he was a water-carrier. He was also taken into the tent. The congregation waited breathlessly to see what would happen next. In a while, the flap of the tent was lifted and Guru Sahib came out, exuding a spiritual vigour and radiance which stunned the sangat. Behind him came the five Sikhs who had so willingly offered their heads. Everyone was filled with wonder at this marvel. They could not believe their eyes. Now, many moved forward. One of them said, “Guru Sahib, forgive me. My family have been Sikhs for three generations and received untold blessings from you. Yet, when the time came to prove my faith, I hesitated. Please, take this useless head,” and he prostrated himself at Guru Sahib’s feet, teary-eyed. Guru Sahib saw that many more were crying out of regret at their lack of faith and courage. In a loving voice he said, “You are all mine and I am yours. These Beloved Five are gurmukhs, those who ran away were be-mukhs (deserters), but you all are sanmukhs (having belief in their Guru), and those who are still undecided are manmukhs (slaves of their egos). “Sikhi is truly wonderful for out of it have emerged five selfless ones. A community, a nation is alive and vibrant because these Five Beloved (Punj Pyaarey) form its back-bone. I am elated that today these five gurmukhs and innumerable sanmukhs are in front of my eyes, while thousands more wait eagerly beyond. My dear ones, I have no wish to take your lives. I only want to kill the self-love and worldly attachment in each of you and replace it with a divine force to make you alive to a higher and fuller life. “Guru Nanak put Bhai Lehna through a number of tests and when Guru Sahib was satisfied that he was the right person to uphold the honour and glory of Sikhi, he anointed him as Guru Angad, our second Guru. One by one, they all bowed with reverence to the Five. Guru Sahib mingled with the sangat for some time and then left the diwan, accompanied by the Five Beloved ones. 1: Sangat Singh (Kuala Lumpur, Malaysia ), April 05, 2017, 3:54 PM. Thanks, Bimal ji, for undertaking such a delightful but an onerous task soaked in love. This is more than a bedside story. It is also an autobiographical script of this ‘Bacchitar Natak’ - the wondrous play of being in deep, timeless meditation, unwilling to come out, but ordained to go forth into the world under His Command. There was no choice to refuse. Bimal ji, thanks for holding our hand and taking us along on this wondrous journey.